Testing showed AllSweep's centrifugal fan is capable of producing a maximum air flow of 31,000 CFM, thanks to a unique design by Gradall Industries. 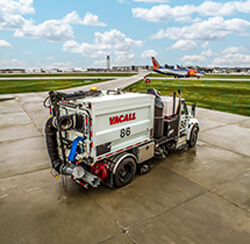 "We are confident that our exclusive collection of productivity features, along with superior vacuum force capabilities, makes the AllSweep the top-of-the-line sweeper choice for both governments and contractors," said Bill Petrole, vice president of Vacall products for Gradall Industries. Among the AllSweepâ€™s other advantages is the industryâ€™s widest sweep path â€“ actually wider than the width of the chassis â€“ so it can make shorter work of bigger jobs. Either single or dual sweep systems are available, as well as full-width nozzles and gutter brooms to collect litter, stones, asphalt millings and debris. Another operator efficiency advantage is a position memory feature to raise and then restore nozzle height when encountering curbs, speed bumps and other obstacles. AllSweep's single-engine design is part of the "Green That Works" collection of features in every Vacall machine, increasing productivity while preserving the environment. AllSweep models effectively reduce both fuel consumption and the release of harmful emissions while delivering greater operating efficiency and overall cost-savings when compared with competitive two-engine sweepers. When in use, a new hydrostatic drive system controls chassis travel speed while maintaining a specific RPM level to deliver consistent hydraulic power, water flow, vacuum forces and other cleanup functions â€“ a revolutionary concept to assure excellent performance for multi-function equipment using a single engine. A color LCD display screen clearly displays machine performance through AllSweep's AllSmartFlow CAN bus smart control system, which is standard - not an option. The control system allows for more precise water flow and vacuum adjustments and is available with a fully proportional pendant, either wired or wireless, to make productive control away from the chassis possible. The rugged debris tank hopper, which is strengthened with reinforced steel to withstand the abuse daily tasks may provide, is available in various capacities. Designed to lead the industry with optimum product sustainability, all tanks have a durable powder coat finish. Optional stainless-steel tanks have a lifetime warranty. Additional features include: a water system with up to 600-gallon capacity which allows for longer runs and less time spent refilling; a new silencer to reduce noise during operation; and a hydraulic system with easily accessible, ground-level gauges and filters. AllSweep models can be equipped with a catch basin cleaner hose, adding to the versatility of the machines. When not in use, the high-power vacuum hose, boom and tubes (available in various sizes) fold compactly against the tailgate, which opens, closes and locks hydraulically, speeding up the dumping process. Learn more about AllSweep. Or call 800-382-8302. Find your authorized distributor here. All Vacall machines are designed and manufactured in the U.S. at Gradall Industriesâ€™ facilities in New Philadelphia, Ohio.